I'm really torn over this book. It started off pretty well with its unique premise, but it ended up going downward thanks to the slow pacing and confusing plot. 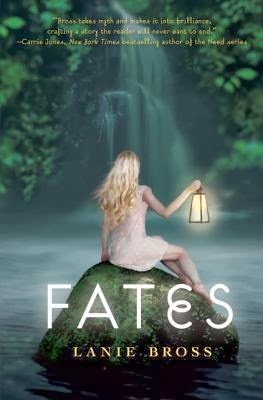 What I liked: Fates had a unique premise. It just wasn't explained well enough, and the storyline was so confusing that it just didn't work. Anyway, I liked that the point of view was third person. It seems pretty rare to find that POV in young adult books lately, and I enjoyed it. The author did a good job with that aspect of the book. And I appreciated the fact that, for once, the girl was the one with paranormal powers, not the guy. That's something else that doesn't happen often in YA, and I liked that the author chose make the girl the one who has magic powers. The writing is also absolutely gorgeous. The descriptions are so vivid and lovely, and even though I really enjoyed the gorgeous prose at first, it quickly turned into a negative thing. What I didn't like: I mentioned that the prose was descriptive and well-done, but there was just...so much of it. There are certain books where descriptive prose works, such as Lauren DeStefano's books, since they are balanced out by dialogue and action. But it didn't work with Fates. There was tons of description and narration, and not nearly enough action. There'd be pages of Corinthe's or Lucas's thoughts without any dialogue, and it made it so hard to pay attention to what was happening. This book was in sore need of less descriptions and more action. The plot itself, although unique, was extremely confusing. Despite all the description, the setting didn't make sense, and it was hard to keep track of where the plot was going. Everything that happened seemed so random, and once I got to the end, it all felt like one big setup for the next book. The romance was also full of insta-love. Corinthe and Lucas were way too willing to sacrifice anything to be with each other; there wasn't enough build-up or chemistry. A small thing that also annoyed me was a scene a third of the way through, where Corinthe is holding a knife to Lucas's throat and getting ready to kill him, and he starts thinking about how much he wants to kiss her. Just...seriously? What sane person thinks that? A similar scene happened in Nobody by Jennifer Lynn Barnes. I just don't get it. Overall, I wasn't a fan of this. Lovely writing and a couple unique aspects, but the prose quickly became irritating, the plot was confusing, and the romance wasn't well developed. If you don't mind a slow-paced story with loads of description, you might find yourself enjoying this, but I couldn't get into it. *Sigh* and I was so looking forward to this one, and then the less than stellar reviews came in. Joy. I love that it's third person though, I used to hate it, but really enjoying it now. Though I feel first person's more personal, I finished one last week that was, and I felt no connection whatsoever, so I guess it goes both ways. Shame about the insta-love though. I mean, it's all on the character whether I mind it or not, you know? But, I always hate over-the-top-I'd-die-for-you-though-I've-known-you-five-minutes type. And ugh, over descriptive, I know it's nice to envision a place, but when you find yourself getting bored is annoying. I really had high hopes for Fates, too. :( Great review! I know! I was pretty disappointed too, especially since the premise and the whole idea of fates and Greek mythology was so awesome. I agree, both third person and first person POV can be amazing in their own ways. And yes, insta-love can work on occasion, but it just wasn't believable in Fates. :/ Thank you for the thoughtful comment, Kirsty!